Make Your Goals Simple for 2014 — Live! Love! Laugh! — It doesn’t get better than that. Each day is unique. Each day carries unlimited potential — power that belongs to you — power that you can choose to use in whatever way meets your needs. Acknowledge it — understand that it is always there. Remember – The Angels of Solution are Always There For You! Great Release Program — Day 31! Congratulations! You HAVE SUCCEEDED! Congratulations! You have completed this year’s Great Release Challenge! What will you do with the empowered new you? Today: Angels of the New Year! Congratulations! By finishing today’s challenge you will have successfully completed this year’s Great Release Program! Whoo-hoooo! Good job! I am so proud of you! How did the program work for you this year? Did you find December to be less stressful? Were you able to meet personal challenges with joy or at least been able to ride through the stress with a calmer attitude? Do you feel better than when you started? Some of your success you can see right now; however, during 2014, you may discover hidden achievements as a result of this year’s program. These will surface as you need them. Before we continue with our last day together, I would like to thank you for working so hard with me this year! It has been a pleasure to spend quality time with you. I realize how busy your schedule is and that reading and following the program is a gift of your time. Everything has a pattern — some more stable than others. With each new pattern, Spirit provides an intelligence to watch over it. Some people see this intelligence in the form of Angels. Each new year has its own pattern — the highs, the lows, the accomplishments, the sorrows. Every year has its own energy. It is up to you to blend what is right for you along your path of enlightenment. Yesterday we talked about the astrological energies that will be active on New Year’s Eve. The moon moves into Capricorn in the afternoon (morning for some) giving you a platform of structure, limits and reward. 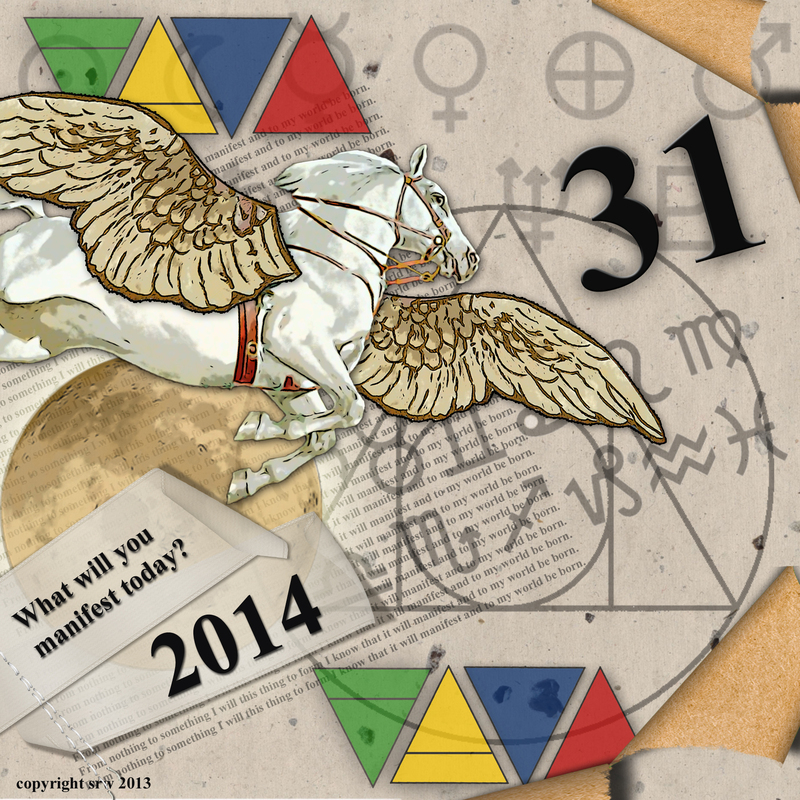 Capricorn is an excellent sign for Goal Setting and Resolutions! Today, I would like you to take a small, plain brown paper bag, and write My Wishes and Goals for 2014 on the front of it. Then, take the time to write out exactly what you would like to accomplish in 2014 on a piece of paper. Put the paper in the bag. Next, time to take a Spirit Walk with your bag. You can go outside, or you can stay inside — the point is that you focus on communing with nature and a higher power as you move around, intuitively placing items in the bag that you feel match your 2014 goals. You will burn this bag at the stroke of midnight tonight, so don’t put anything in there that you want to keep. Take your time on your Spirit Walk. Try not to rush it, if possible — but, if you are pressed, flow with it and do what you can. The fact that you put any effort at all into the task is what is most important. What might go in your bag? Herbs, bits of ribbon, a feather you find…you choose the contents of the bag. When you have finished with your walk, put a lock of your hair in the bag — this is to tie your mental goals to your physical self, so be sure you really want what you are asking for. If you have plenty of time, feel free to decorate your bag with colors, sigils, doodles — again, you choose. Before closing, blow three, deep empowered breaths into the bag, then tie, staple or glue shut. Sit quietly and rub the bag in your hands, first connecting with nature, and then connecting with Spirit. 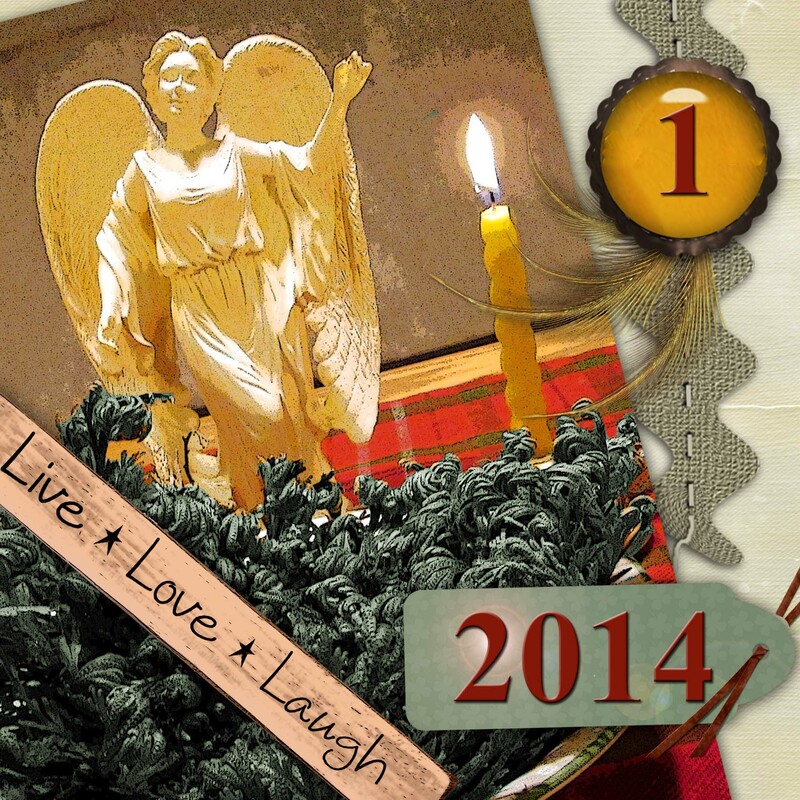 Ask the Angels of 2014 to help you. They are locked and loaded, ready to get to work helping you. Continue rubbing the bag and thinking about your goals — don’t let negative thoughts wiggle in — keep focused, breathe deeply during the process. When you are finished, your hands will probably be very hot. That’s just fine. Seal your work by drawing an equal-armed cross in the air over the bag. Set the bag aside. At the stroke of Midnight tonight — burn the bag. For those of you living in warmer climes (where the ground is not frozen) you can use an old Braucherei technique of burying the bag in the ground for three days. On the third day, resurrect the bag, add more energy to it, and then burn it — releasing this power to the universe for the fulfillment of your desires. Signs from New Year angels include bells ringing at odd times, seeing or receiving new, innovative items, being given a gift with the number of the new year (2014), and baby related items (no kidding). Today’s Challenge –– Yesterday we worked with the concept of “As Above”. Today we work with “So Below”. Clear out junk, dirt, clutter, good stuff from under tables, beds, closet floors, cupboards, etc. This allows chi (energy) to move freely and removes pockets of negative energy. What is in the physical, is reflected in the astral. A dirty, cluttered, stinky, smelly environment allows negativity to grow in the field around you — the field that directly affects your mental and spiritual health. Empower this field with positive thoughts and cleanly habits and your life will improve exponentially! Once you have completed this task, walk around your living area and tidy up anything that managed to bounce out of hand in the last week. Make note of the bigger projects that you didn’t quite finish and set a future goal for yourself to take care of those things. Finally, take the time to congratulate yourself on a job well done and be sure to give yourself a reward! Go to the movies, buy that “thing” you always wanted, or promise yourself (and keep it) that from now on you will take time for personal joy rather than ignore your needs. It is okay to get that special item or enjoy that unique experience — really! I think I want to go rock climbing with my daughter. Summary: The stage is set for an amazing new year! Over the last thirty-one days we’ve worked with angelic energy in a variety of ways. We’ve also kept in tune with the daily astrological energies — particularly the moon in the signs and the days of the week. By knowing what sign the moon is in each day, Spirit has given us a temporary map of the emotional timbre of what we may experience. The moon in the signs — such a powerful tool — is often ignored by the whole of society; yet — here it is — an amazing head’s up of what type of opportunity we have available to us AND ideas on how to use these energies to improve our lives. Today we made a simple spell bag using our intuition and a Spirit Walk. You may wish continue the practice of a Spirit Walk around future new or full moon times. (2) Take one last walk through your environment — make note of your accomplishments and plan to finish those things you couldn’t get to. (3) Make a New Year wish bag. (4) Take a Spirit Walk. (5) Empower your Wish Bag and burn or bury at midnight. (6) Throw out at least one thing today (no give-aways). Today’s toss is very important. (7) Do one Mad Minute Exercise. (8) Clean out underneath — the “So Below” part of today’s challenge. (9) Have a marvelous and wonderful Happy New Year! I will miss you. Merry Part Until We Merry Meet Again.